So much discussion is out there related to the different methods of Pilates training that I wanted to illustrate mine. Of the numerous ballet teachers and Pilates masters who have influenced me through the years, a few are particularly of note because of their connection to Joseph Pilates himself. 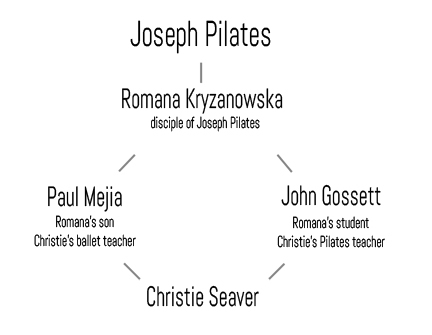 One of Pilates’ disciples was Romana Kryzanowska. Her son taught me ballet. She also taught my Pilates instructor. John Gossett trained me in Pilates initially, and I work with him whenever I return to the States. John brought Pilates to Houston. Prior to training in Pilates, John enjoyed a dancing career with Chicago City Ballet under director Paul Mejia. It just so happens Paul Mejia is Romana Kryzanowska’s son. Why does that matter? Well, Romana, as she was known, was one of Joseph Pilates’ proteges, largely credited with carrying Pilates’ original work into the present day. Many instructors today might state they are ‘Romana trained,’ hinting at their lineage to Romana herself. Romana worked with Joe and his wife Clara in their New York studio, and kept a close hold on his original exercises, until, after some controversy, the exercises were released into the public domain in 2000. Sadly, Romana passed away in August 2013. Although I never met Romana, I have worked under two people closely connected to her: John, as already mentioned, and her son Paul Mejia, when I was an apprentice with the Fort Worth Ballet (now Texas Ballet Theatre). At the time I had no idea “Mr. Mejia,” as we called him, was so well-connected to Pilates. I knew he could correct us into doing triple pirouettes with a slight nudge of his wrist, and could lift us all, repeatedly, without looking tired or injured – obviously using his core. His mother’s influence must have seeped into the way he moved, and in retrospect, I see how Pilates came out in his ballet teaching. It must have been in his bones. So if ballet and Pilates are passed down through muscle memory, I hope I do justice to the instructors who have taught me. I am blessed to have worked with such good ones.